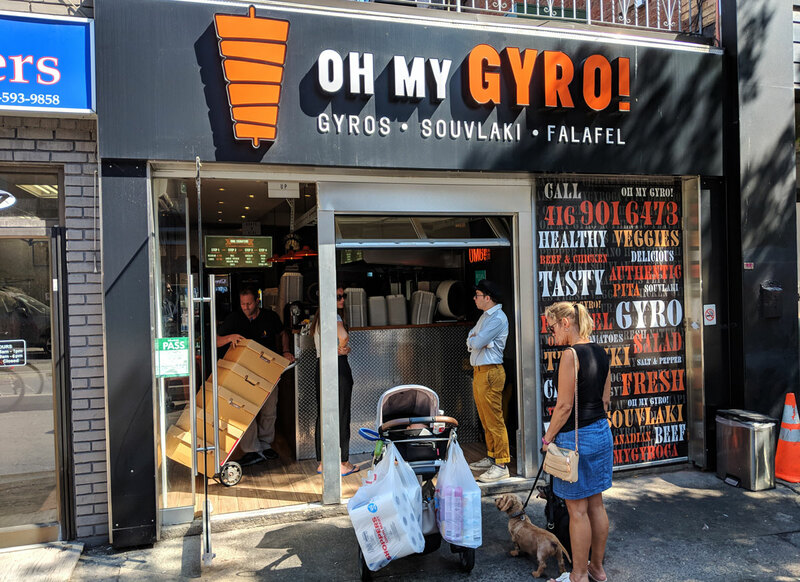 Tasty Greek Wraps at Oh My Gyro! 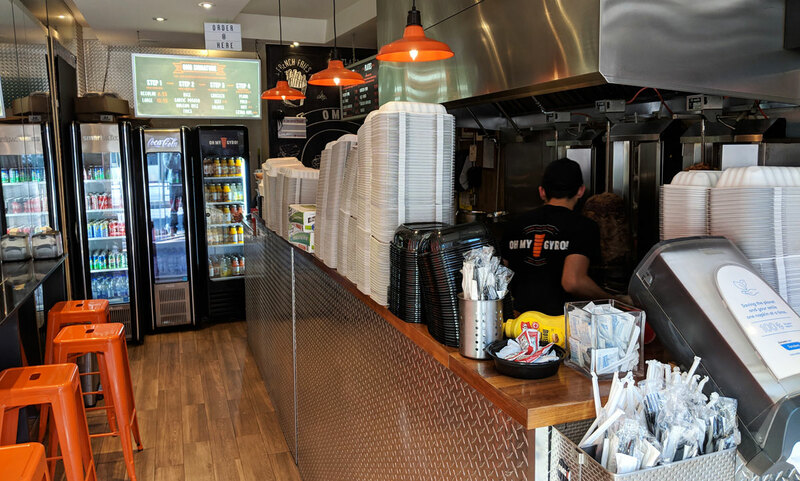 I got the chicken gyros wrap (you can also get beef doner, chicken souvlaki, or falafel), which comes crammed with chicken, tomato, tzatziki, garlic sauce, and hot sauce (and onions, which I elected to skip). Seriously: it’s a hefty wrap. The photo makes it look pretty normal, but it was filled with a dense reserve of chicken, probably about the size of my forearm. It must have weighed about a pound. It’s good quality stuff — the chicken is super tender, with a good amount of crispy bits (I probably could have used more, but then you can never have enough crispy bits). This might have been my imagination, but it had a slightly lamby flavour, like they had mixed lamb fat in with the chicken. Whatever it was, it was good stuff. But there was a little bit too much of it. It made the wrap ridiculously difficult to eat without making a huge mess, and the balance of flavours was a bit off. The wrap only cost about eight bucks, and would have still been a great deal with about half the amount of meat. That’s a fairly minor complaint, though. 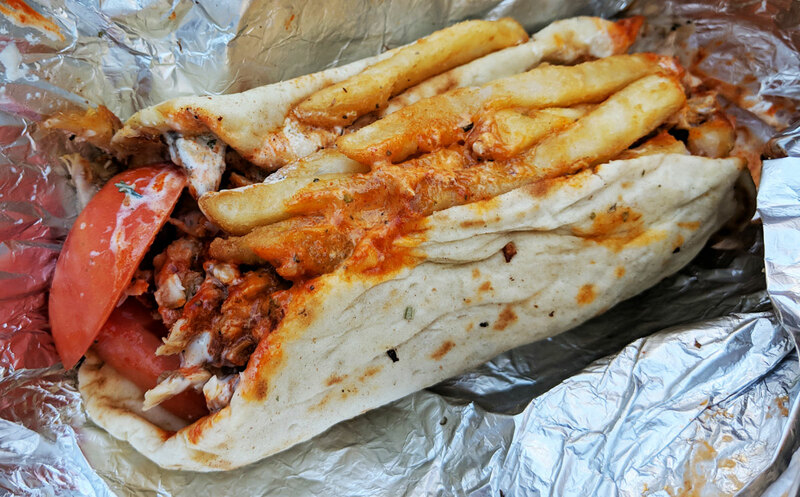 Everything about this wrap worked really well — the herby flavour, the delicious garlicky sauces, the zippy hot sauce (I went with extra hot, and it wasn’t kidding around), the fresh tomatoes, and the soft and chewy pita bread. Even the fries worked really well — I’m normally not a huge fan of fries in a sandwich, but these were fresh and tasty, and complimented the wrap’s other flavours perfectly.